First Response aims to investigate how the primary healthcare workforce can be supported to integrate culturally safe trauma-informed care for Aboriginal and Torres Strait Islander women who have experienced violence. This project responds to recommendations for trauma-informed care within healthcare settings for women who have experienced violence, but also to women who have expressed a desire to seek support in healthcare settings rather than from the police or frontline services. Furthermore, this project has been developed in response to engagement with end-users from Aboriginal Community Controlled Health Organisations and peak bodies who have described a lack of coordination between the health and justice workforce, and the need for enhanced workforce support. First Response will benefit the health of Aboriginal and Torres Strait Islander peoples by providing evidence and critical insight into how the primary healthcare workforce can be supported to provide trauma-informed care that is culturally safe. First Response has been developed to ensure it is relevant to end-users in primary healthcare by bringing together a multidisciplinary partnership of stakeholders to direct this program of research in a meaningful and ongoing capacity. An action-oriented Steering Committee brings together stakeholders from primary healthcare, specialised services and peak bodies to provide direction and oversight of the research processes, knowledge translation and communication. This steering committee will form the basis of an ongoing and robust collaboration that will pursue a planned program of research beyond this current project. Underpinning First Response is a strong commitment to the development of an Aboriginal and Torres Strait Islander research workforce. The project has three Aboriginal and/or Torres Strait Islander early career researchers as chief investigators: Ms Marleen Longbottom, Ms Julieann Coombes and Mr Bobby Porykali. Using decolonising methods, First Response synthesises a systematic review, interviews and yarning circles with representatives from peak bodies, specialist family violence services, and Aboriginal Community Controlled Health Organisations in NSW. First Response establishes a research partnership and baseline evidence that will inform service delivery and outline existing systems, processes and strengths that can support the primary healthcare workforce to integrate culturally safe trauma-informed care and ensure that the first response is the right response. 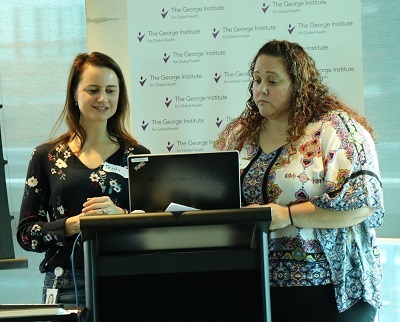 Patricia Cullen and Marlene Longbottom presenting at the Knowledge Translation (KT) workshop held on 18 October 2018 at The George Institute. Image courtesy of Patricia Cullen.